When is water renewal necessary? Have you noticed that the flow of water into your home isn’t what it used to be? Perhaps you have found that if you have more than one or two taps running, the water flow reduces to almost a trickle. Or do you find that if you want to take a shower you first need to go around the house to make sure that every other water using appliance is switched off to avoid getting scalded. If so, then the cause may well be the condition of the piping that runs from your water meter into the house. In previous times, these pipes traditionally were constructed of galvanised steel to provide longevity under your garden and lawn. However, over time a combination of corrosion and a build up of impurities in the water supplied to your house is likely to result in a build up of sludge inside the pipe, thus reducing the space that water has to flow (as can be seen in the photo on the left). This of course results in significantly lower low rates being available within the house that would be expected with fresh and clean supply piping. 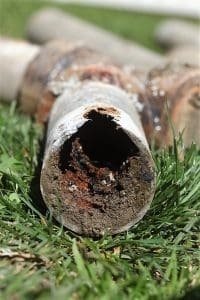 Galvanized pipes have a tendency to corrode internally with age as this corrosion occurs it can have a detrimental effect upon the quality of the water in your home. During Water Renewal corroded galvanized pipes are replaced with copper or PVC pipes improving the quality of the water you use in your home. Inner City Plumbing have many years experience in water renewal and we are happy to advise customers on the best course of action to improve the quality of their water. We have the tools and expertise to ensure effective repair and renewal of subterranean water supply pipes, particularly to houses like yours. Water Renewal	Overall rating:	4.6	out of 5 based on 117	reviews.